Ever wonder how the winds of change of Vatican II are reflected in the later reform of canon law? 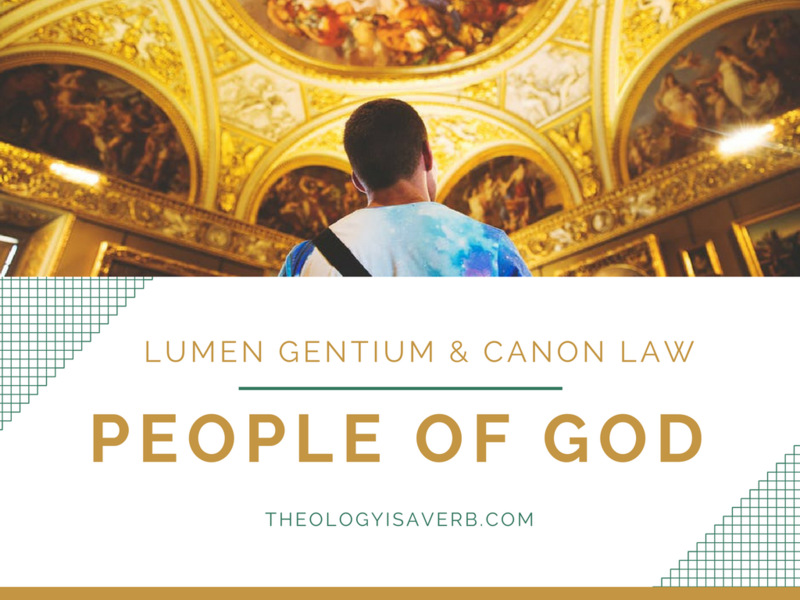 Perhaps for the laity, one of the most interesting connections can be found in the highlighted principal of the “People of God” in Lumen Gentium within the fullness of the Church’s life and mission. From a cursory glance at Vatican II, the understanding that one gains of the “People of God” is a pastoral description of “what it means to belong to the Church and, in particular, how lay Christians are called to ‘be in the world but not of it’ as good citizens of the City of God.’” It does not just denote an individual’s relationship to God but what it is to be brought “together as one people, a people which acknowledges Him in truth and serves Him in holiness” (LG, 9). It is an invitation to be enjoined in a covenantal relationship with God, united in Christ, and guided by the Holy Spirit (LG, 9). This term is inclusive of the entire body of Christ, the laity, religious and holy orders. All through baptism are considered among the ‘faithful’ members of the church, ordained and not, who through their respective vocations and reception of the sacraments seek to participate in the Christ’s mission in the world. (LG, 11) Similarly defined, canon law describes the people of God as those baptized, having been “incorporated in Christ” and “made sharers of the priestly, prophetic, and kingly missions of Christ’ (c. 204 § 1). In their ‘profession of faith and participation in the sacraments through the Church the Christian faithful enjoy full communion with Christ’s church on earth’ (c. 205). Therefore we see that within the community of the people of God there are differing extents to which one’s incorporation is enjoyed. Following this description of the faithful we are given in Canon 207 the distinction between the ordained sacred minister, also known as “cleric”, and the non-ordained “lay person” (c. 207 § 1). While there are those from both groups who share in their commitment to the evangelical counsels of chastity, poverty and obedience, only the ordained belong to the hierarchical structure of the church (c. 207 § 2). Accordingly, those who profess vows through a religious institution are deemed as religious, whereas members of more secular institutions making sacred bonds are considered laity. Based upon their designation or appointment to an ecclesial office, the non-ordained may be given additional obligations or responsibilities. Each does, however, in this respect contribute to the overall holiness and life of the Church. All Christian faithful, by virtue of the diversity of their gifts are called within their vocation to the “building up of the Body of Christ” (c. 208) and its continual sanctification (c.210). With the decline in vocations to the priesthood in recent years, much discussion has surrounded the increasing participation of the laity within the life of the Church. In light of the above consideration of Canon law 207 and Lumen Gentium, several thoughts emerge. First, we as faithful are continually invited to step forward and participate more fully in the life of the Church. Secondly, for those in lay ecclesial positions, who have chosen to accept more responsibility in the church, we are reminded to call forth the gifts of others as well. Finally, as the people of God we have been given a sacred duty to encourage, through our faithful witness of the Gospel, new vocations to the priesthood. Each of these has been found to be essential in promulgating the faith and participating in a community enlivened by the Gospel. How might I be called to use my gifts more fully in the life of the Church? Am I also praying for and encouraging vocations both to the priesthood and for an increase in the work of the laity?